For the very first time since University Challenge began in 1962, St John’s College will have a team in the final. The current University Challenge team made history last night with a decisive semi-final victory over the University of Edinburgh, 270-60. They will now face either Merton College, Oxford or Newcastle University in the final which will be shown on 23 April. The furthest any previous team from St John’s have reached was the semi-final in the controversial 2008-09 competition. St John’s lost the semi-final to Corpus Christi College, Oxford who ultimately won the quiz but were later disqualified after it was discovered one of their team members had broken the rules. For the first time in University Challenge history, the quiz show final will feature a team from St John’s College. In the 46 series of University Challenge, 13 Cambridge colleges have been represented in the finals, and six have claimed the winner’s trophy but until now St John’s has never made it beyond the semi-finals. 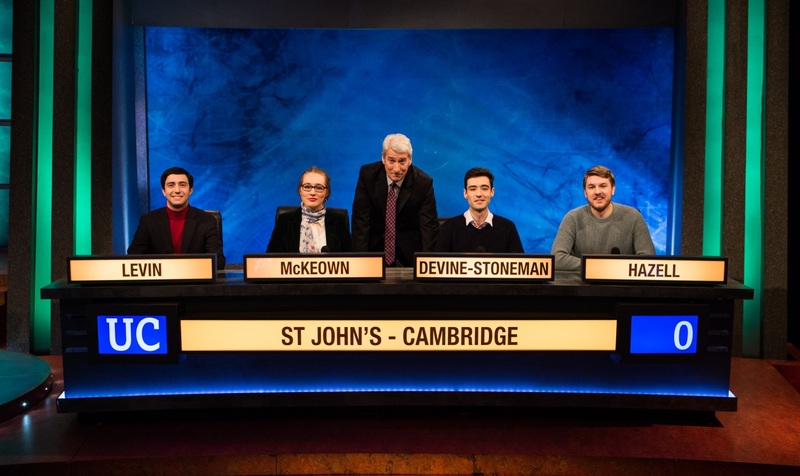 Last night’s University Challenge episode changed all that, as the St John’s College team, made up of students James Devine-Stoneman (team captain), Rosie McKeown, Matt Hazell and John-Clark Levin, beat the University of Edinburgh and secured their place in the final. It looked like the Edinburgh team would be tough opposition having won their last round against the University of Bristol with a huge margin of 135 points. Undaunted by this, the St John’s team started their phenomenal performance by taking an early lead. They buzzed in with the correct answers for the first five questions and gained 95 points before Edinburgh were able to get their first starter question. Devine-Stoneman, Levin, McKeown, and Hazell remained fast on their buzzers, lengthening their lead by correctly answering questions on pineapple producing countries, Lord William Bentinck, native languages, and composer students of Schoenberg. They ended the episode with a total score of 270, easily beating Edinburgh's score of 60. This means St John’s now advance to the final with an unbroken winning streak after triumphing in all five of their rounds. Their future opponents will be decided in the upcoming semi-final between Merton College, Oxford and Newcastle University, both of whom have proved to be formidable teams in this series. Merton College are particularly threatening as, like the St John’s team, their winning streak is currently unbroken. St John’s have been through to the semi-finals only once before, in 2009. They were pitted against Corpus Christi College, Oxford captained by Gail Trimble who was nicknamed by the tabloids as “the human Google”. St John’s lost, 250-150, and Corpus Christi went on the win the competition, beating the University of Manchester in the final. Unfortunately for Corpus Christi it was discovered after the final was aired that due to a technicality one of the team members, Sam Kay, had broken the rules. Although he was a student at the start of the series he graduated before the final rounds were filmed. As a result Corpus Christi were disqualified and the title went to the University of Manchester. It is still uncertain whether Lincoln College, Oxford or St John’s College, Cambridge are technically the runners-up for this series. St John’s College is still trying to ascertain full details of College appearances on University Challenge and there are still some series for which the College does not know the names of all the team members. Fiona Colbert, the Biographical Librarian of St John’s, is compiling a list of all Johnian participants in University Challenge, and would be glad to receive further recollections from anyone who has taken part in the programme. If you would like to get in touch, please email Fiona Colbert. The current St John’s team can be seen in the final of University Challenge on BBC Two on April 23 at 8.30pm.